Christmas Spectacular is a cracker of show with music, dance, lights, spectacle and a snow-filled finale. 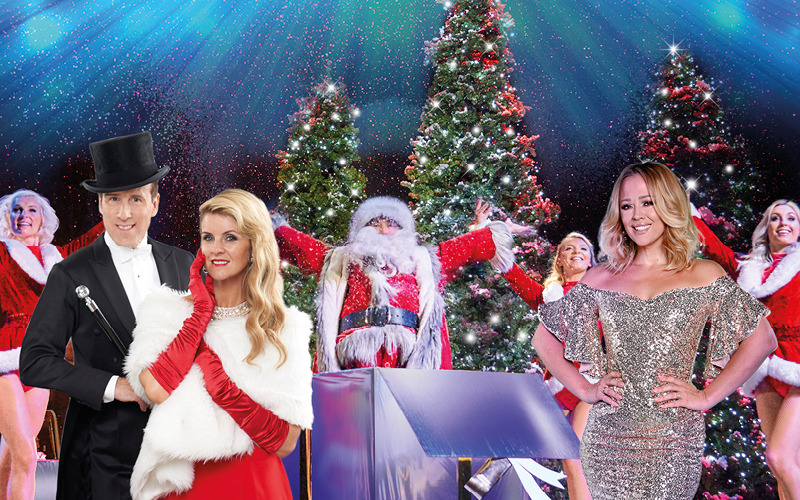 The show will spring to life with high kicks, festive fun and special effects plus all the trimmings in the company of a full show band, west end vocalists and our all-star Jingle Belle Dancers. Join in with toe-tapping tunes and sing-along to seasonal songs including Merry Christmas Everyone, Winter Wonderland, Jingle Bell Rock, Santa Claus is Coming To Town, I Wish It Could Be Christmas Everyday, Sleigh Ride, Have Yourself A Merry Little Christmas, Rockin’ Around the Christmas Tree, Merry Christmas Everybody and many more… It’s the ultimate, unmissable Christmas party. The show will include West End stars Kerry Ellis & Tim Howar, The Jingle Belles and the London Concert Orchestra under the baton of conductor John Rigby. They will be joined by special guest Kimberley Walsh and the nation’s favourite ballroom dancing couple Anton du Beke and Erin Boag, who have both appeared extensively on ‘Strictly Come Dancing’ and have been dancing together for over twenty years. Christmas Spectacular is at the Theatre Royal Drury Lane and the London Palladium from 16 - 23 December. Call 0207 097 7755 or visit the MyChristmasLondon website for more information and to book tickets!